Unfortunately, this technology struggles to interpret the emotions of black faces. 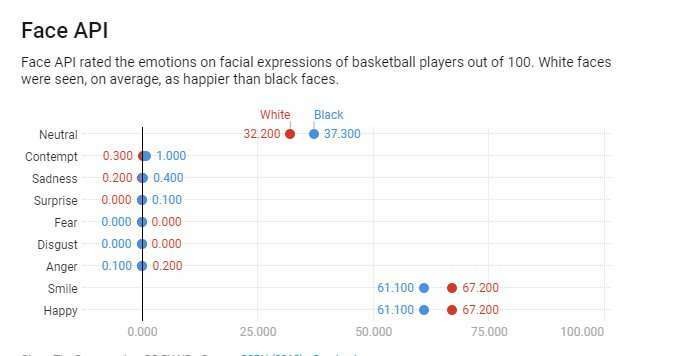 My new study, published last month, shows that emotional analysis technology assigns more negative emotions to black men's faces than white men's faces. This isn't the first time that facial recognition programs have been shown to be biased. Google labeled black faces as gorillas. Cameras identified Asian faces as blinking. Facial recognition programs struggled to correctly identify gender for people with darker skin. To examine the bias in the facial recognition systems that analyze people's emotions, I used a data set of 400 NBA player photos from the 2016 to 2017 season, because players are similar in their clothing, athleticism, age and gender. Also, since these are professional portraits, the players look at the camera in the picture. However, Face++ rates Hayward's expression as 59.7 percent happy and 0.13 percent angry and Collison's expression as 39.2 percent happy and 27 percent angry. 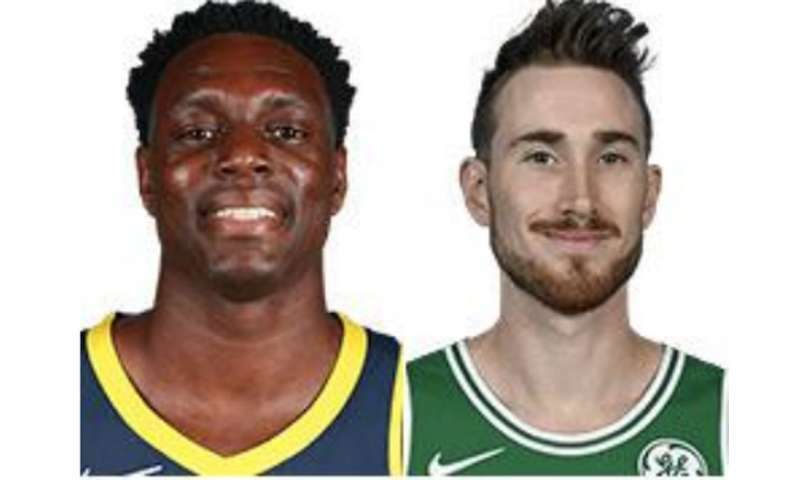 Collison is viewed as nearly as angry as he is happy and far angrier than Hayward – despite the facial recognition program itself recognizing that both players are smiling. In contrast, Microsoft's Face API viewed both men as happy. Still, Collison is viewed as less happy than Hayward, with 98 and 93 percent happiness scores, respectively. Despite his smile, Collison is even scored with a small amount of contempt, whereas Hayward has none. Some researchers argue that facial recognition technology is more objective than humans. But my study suggests that facial recognition reflects the same biases that people have. Black men's facial expressions are scored with emotions associated with threatening behaviors more often than white men, even when they are smiling. There is good reason to believe that the use of facial recognition could formalize preexisting stereotypes into algorithms, automatically embedding them into everyday life. Did you ever consider that social factors play a role in how facial expressions are interpreted/perceived? Is it possible that on average people of color score higher for "negative" emotions because they do, in fact, have underlying feelings of fear, anger, anxiety, etc. due to the social circumstances they were brought up in? Perhaps this software is picking up on these subtle clues. Have studies been done that control for socio-economic background to see if similar results occur across racial lines? It may just be a fact that a smiling white person is in reality 5% happier than a smiling person of color, because, on average, a white person doesn't have to deal with systemic oppression on a daily basis like people of color do. S, wanna bet how many of these researchers, data collectors or analysts are non-white? @rrwillsj: I wasn't going down the racial bias path in data collection/researchers, more going towards the other influences in a person's facial expressions that might need to be controlled for to truly understand whether there is bias in facial recognition software. The way the data was presented highlights several assumptions that could impact results that need to be addressed before we can conclude, as the paper does, that bias does exist in this software. Maybe the smiling face of the average non-white person really does show more tension (for non-obvious personal, social or economic reasons) than that of the average white person. S. I can agree with your last comment. Now, how do we bell the cat of social conditioning? That precludes the innate prejudice of "Not-My-People, therefore I expect them to behave so & so..."